The modern economists like Pareto, Mrs. Joan Robinson, Boulding, Stigler, Shepherd, have tried to simplify and generalize the Ricardian theory of rent, According to them, the Ricardian theory of rent is too closely related to land. This creates on impression that rent is a peculiar earning of land only. The fact, however, is that other factors of production i.e., labour, capital and entrepreneurship may also be earning economic rent. The determination of rent, the modem economists say, can be explained in the same manner as the reward of other factors, that is by demand and supply forces. Demand for a factor. The .demand for a factor which may be land, labour or capital is a derived demand. Land, say for instance, is demanded for its produce. The higher the produce, the greater is the demand for land. A firm will pay rent equal to the marginal revenue productively of land. The rent diminishes as more land is used due to the operation .of law of diminishing returns. The demand curve of a factor is, therefore, negatively sloped which means more land will be used only at lower rents, other things of course remaining the same. The supply of land,to a particular use (say industry) is quite elastic. It can be shifted to other uses by offering higher rent than that being earned by it now. The supply of a factor (to an industry) is, therefore, rent elastic. If higher rent is paid, the supply of a factor can be increased by withdrawing it from other uses. The supply curve of a factor course remaining the same. (industry) slopes upward to the right. Determination of rent. workers employed in a particular industry at OW wage rate is OL. The total earning of the workers employed is equal to the area OWEL. At wage rate OW, there are workers who would work at lower pay but they are also paid at OW wage rate. Those workers whose transfer earnings are less than this wage rate will be getting economic rent The total economic rent earned by all the intra marginal workers is equal in the area WES. 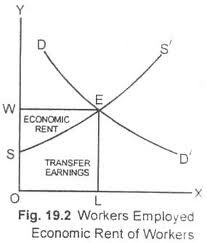 The marginal worker i.e., Lth worker is not obtaining any rent or surplus. Rent is a surplus return. The modern economists are also of the view that rent as a surplus can be earned by other factors also. It is not peculiar to land alone as explained by Ricardo. The modern theory of rent is that it is the difference between the actual earning of a factor unit over its transfer earnings. The transfer earnings of a factor of production is the minimum payment required for preventing that factor for transferring it to some other use. It is called the factor supply price 01 its present occupation. For example, a worker earns Re. 6000 per month in a factory. In the next best employment, he can get Rs. 5000 only per month. The surplus or excess of Rs. 1000.0 which a worker is earning over and above the minimum payment necessary for inducting him to work in the present occupation is the economic rent. The proportion of the income of a factor that consists of economic rent depends on the elasticity of supply of the factor of production which may be (1) totally inelastic supply (2) perfectly elastic supply and (3) less than perfectly elastic supply. (1) Perfectly elastic supply. When the supply of a factor of production is perfectly elastic, then none of its income is economic rent. Its entire income is transfer earnings.